Whilst in Cayman I got to play with one of my new toys, an off camera flash set up a-la Alex Mustard. It was so much fun I thought I’d share here with you. 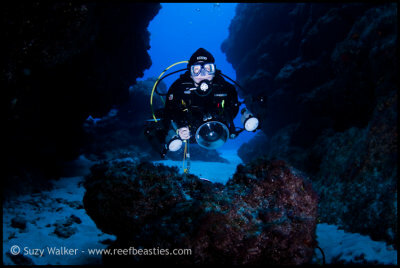 In normal underwater photography our flash comes from the front/top (since the strobes are attached to our cameras) and we have to be quite close to the subject being lit. Off camera flash allows us unusual and creative lighting choices. The basic premise is to have a flash on your camera rig at minimum power and a slave flash off on a tripod with a slave sensor to trigger the flash when the one on your camera goes off. I have two Inon Z240 strobes so I left one on my camera and stuck one on the tripod (unfortunately I forgot my tripod but Alex kindly loaned me his). The tripod is one of the joby gorillapod plastic tripods. Mine is the small mobile one (which I’m now not sure will be big enough) but the one I borrowed was the slightly bigger chunky one. Screwed onto the tripod was an ultralight ballhead that allowed me to use my ultralight strobe clamps to attach my strobe to it. I got Peter Ladell to make me a flash trigger (the same spec as Alex’s). It has a nikonos connector so it can just connect straight into my Inon with a the normal flash sync cord I’d use on my housing. It has quite a nice long lead and made longer by the sync cord. Perfect for being able to hide the strobe in a rocky outcrop of bit of wreck whilst still be able to have the sensor facing you to catch the main strobe light. Attached to the tripod with cable ties is a weight (the same type as you’d put on your weight belt, I think this was 1 or 2 lbs). 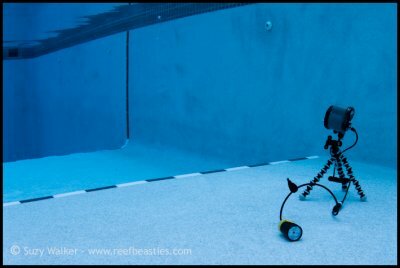 The tripod is plastic (so floats) and the strobe is neutral so the weight is essential for its centre of gravity. I had a little play around with it in the pool in Cayman to check it was working and try and gauge the range of the sensor. I could basically go to the other end of the pool and it still fired (although I had to turn up my strobe slightly for it to catch). Also, I knew I’d blog about my findings and I wanted a photo that showed the set up. I’d been on dives with Alex when he’d been playing with his set up (he’d set up the strobe and we’d take turns in modelling) – see the shots above from Ghannis D in the Red sea. Admittedly we’d been inside wrecks or beneath under-hangs so I think that must be the key – no current what so ever, otherwise it just falls over. 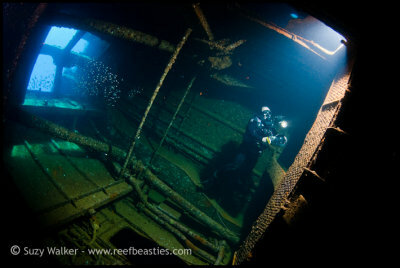 My buddy Kay and I took mine for two test dives in Cayman to have a play and it was more difficult that I thought it would be – although Alex does have a nasty habit of making things look effortless ;). 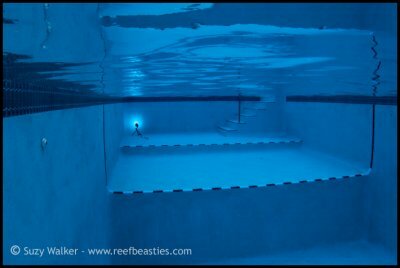 I found it annoying to swim with the strobe/tripod and camera, it meant that both my arms were busy (so equalizing on the way down was a pain) and taking photos without putting it down was out of the question. I think in future I’ll rig it so I can clip it onto myself somewhere and be tight to my body so it won’t dangle down if I’m photographing something else. Also, I think Alex’s Strobe outputs much more light than mine, even at full power the Inon didn’t quite cut it in the same fashion. Where Alex’s strobe would light up a whole person we had to get so close to mine that the light would only fall on our heads. 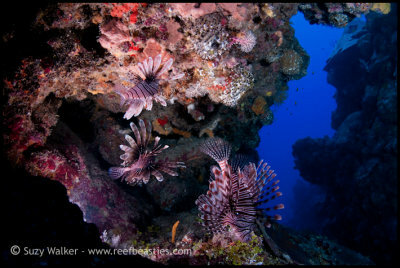 We had a play in a small crack in the rocks where we could hide the light somewhat with the idea of shooting ourselves against the blue but some of the local lionfish came to join the fun, that seemed to be about the right size subject for the inon Z240 so we concentrated on them. By the time four of them arrived I wondered how I was going to get my strobe back without getting my hand stung! As a side note I can’t believe how many and how big the lionfish in Cayman have got since last year! No wonder they are being caught and served as Tacos. All in all it was good fun but I need a lot more practice! I would like to try this someday. I think they create a unique variation on the “typical u/w image” as far as lighting. I guess i haven’t read the manual thoroughly enough – but I thought the Z240’s were already capable of being triggered as slaves w/o an extra device? Thinking about it, I guess if the strobe is hidden away in a corner, the sensor may not see the triggering strobe fire?